Rooney was best known for his show-ending essays for "60 Minutes." 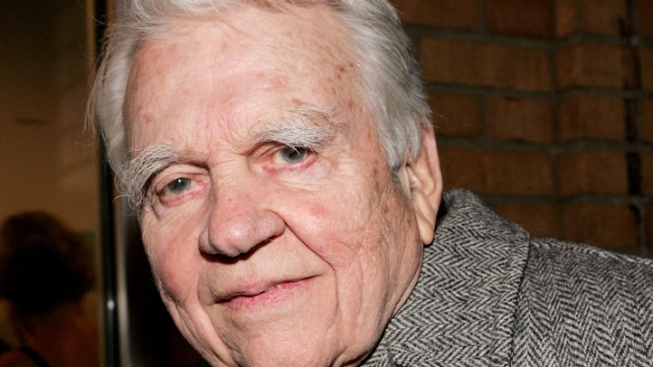 Andy Rooney, the curmudgeonly newsman whose essays punctuated "60 Minutes" for three decades, has died at the age of 92. Rooney worked in television news since the birth of the medium. He spent 60 years at CBS, beginning in 1949, with half of those behind the camera as a writer and producer. He worked in entertainment television before moving to news. He later became a television personality, a role he was never comfortable with, he maintained. In his mind, he was a writer and preferred to be known as one. He was a best-selling book writer, as well as a syndicated columnist. It was when he came to "60 Minutes" in 1978 that he rose to prominence with his show-ending rants. Rooney was famous for his dry wit and observational tone, often expressing sentiments that cut to the truth of the everyday American experience. He had the last word on “60 Minutes” for 30 years, until Oct. 2, when he announced he was stepping down in his 1097th essay. Rooney is credited with creating the genre of the television essay. His sometimes divisive tone would lead to confusion and anger from the public, as well as his own suspension from CBS. An essay written in his style, insensitive to minorities, was linked to him and circulated on the Internet. At another time, an interview was printed in The Advocate magazine that attributed racist remarks to him. Though he denied he made the comments, the interview would lead to his suspension from CBS; the network's ratings plummeted during his absence. Comments regarding Kurt Cobain's suicide - specifically that his suicide ruled him as a waste of humanity - drew further ire. So too did the offer of a $1 million dollar reward after O.J. Simpson's acquittal for murder; Rooney said he would never have to pay the sum, as Simpson had committed the murders. Despite his controversies, the sheer breadth and quality of his work earned him numerous accolades, including multiple Emmys among which was a Lifetime Achievement Award. He published sixteen books and thousands of syndicated columns. The National Society of Newspaper Columnists awarded Rooney with its Ernie Pyle Lifetime Achievement Award in 2003. In 2001, the Freedom From Religion Foundation gave Rooney the Emperor Has No Clothes Award. Rooney lived in Manhattan. He was hospitalized on October 25 due to complications from surgery. He was survived by his four children, Ellen, Brian, Emily and Martha Fishel, five grandchildren, and two great grandchildren.